Local Pest Control Company in Toronto ON has over 20 years experience in offering local pest and animal control services in areas around Ontario and GTA. Initially, we used to offer our services in places such as Ajax, Brampton, Burlington, Etobicoke, Maple, Markham, Milton, Mississauga, North York, Oakville, Oshawa, Pickering, Richmond Hill, Scarborough, Whitby, Woodbridge and Thornhill. But due to the increased demand for our best pest control services, we have expanded and we now cover Brantford, Guelph, Hamilton, Ancaster, Stoney Creek, St.Catharines, Kitchener as well as around the south of the Niagara Falls. However, we are flexible enough and we will heed to your calls should you contact us for our pest control and animal removal services. In all the methods that we use for pest control Toronto ON, we are extremely humane and we do not cause stress or any injuries to the animals. The approaches we adopt are geared towards removing the infestation and stopping future recurrence and we also release the animals to relocate to alternative places where they will no longer cause any nuisance to you and your family. When we are called in to remove wildlife or any other animals that might be causing trouble at home, we will essentially work towards evicting them then taking the appropriate measures to prevent them from coming back. 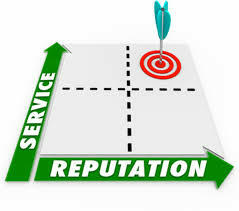 When you call us for our Toronto ON pest control services, be sure that you will get more than what you pay for. We are keen on giving you our best and our pest exterminator will not leave your premises unless the problem is fully solved. We will also accompany our services with complete structural reinforcements to prevent any further intrusion of the pests or the wild animals. You also get a full professional recommendation on the additional measures you need to take so that you can continue living safely without being bothered with the pests or wild animals. 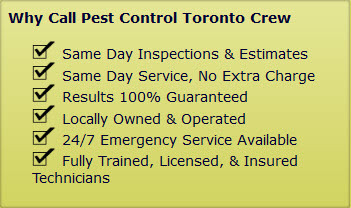 Contact the Pest Control Toronto Crew today for a free no obligation quote so that you can get rid of all the unwanted creatures present in your home. Local Pest Control Company in Toronto ON call (647) 557-7978.